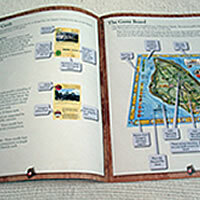 An illustrated map of the Island that shows a summary of all of the Historical Treasures, the Habitat and Natural Treasure categories, and the season indicator. 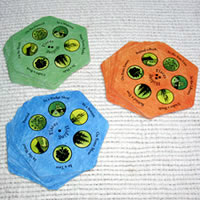 These identify places treasures can be hidden, used for the The Scavenger Hunt and The Treasure Hunt games. 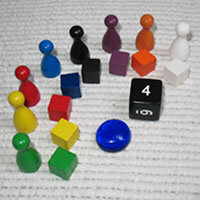 These mark each player's progress around the board, their score, and the season. 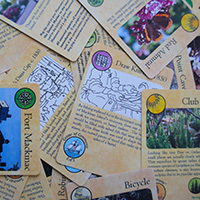 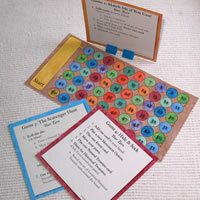 These provide a quick reference for each of the included games and help players keep score. 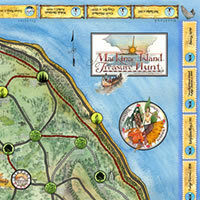 Contains complete rules for all five games, plus some background information if you'd like to find out more about Mackinac Island.